Turmeric (root) is an exotic spice with a distinctive flavor. It is commonly used as a spice in curry dishes and in mustard to give it that signature yellow color. But turmeric is not any ordinary spice. Turmeric contains beneficial vitamins, minerals, and phytochemicals–it is a fantastic spice to add to your diet if you want to improve your overall health. You can also look at the complete list of the nutrients found in turmeric if you are the intellectually curious type. As you can see, turmeric is rich in both manganese, iron, and vitamin B6. Maganese can be found in foods such as, oats, brown rice, and garbanzo beans (chick peas). Unfortunately, manganese is a commonly overlooked mineral and supports our health in several different ways. For example, manganese is required for the production of collagen. Collagen is the structural component of our skin that protects our skin from oxidative damage from UV light. Manganese also helps our body regulate its blood sugar levels . Iron is another important mineral that is commonly found in foods such as spinach, blueberries, and dark chocolate. Our body needs iron to make red blood cells which transport oxygen throughout the body. Iron also allows our muscles to use and store oxygen. When a person doesn’t get enough iron in their diet, they can eventually become anemic (especially women). Anemia is when a person does not have enough red blood cells in their body. As a result, their body becomes oxygen-deprived. Getting enough iron in your diet can ultimately help you have more energy, have a better athletic performance, and even help ensure healthy pregnancies . Turmeric also contains a considerable amount of vitamin B6 (pyridoxine). Found in legumes, carrots, potatoes, peas, eggs, diary, liver, and other meats, vitamin B6 is essential for our well-being. We need vitamin B6 to keep our skin healthy, form myelin sheaths (a layer that forms around nerve cells that help with signaling), and produce important neurotransmitters such as serotonin and norepinephrine. Vitamin B6 deficiencies are also often attributed to chronic fatigue. Vitamin B6 is yet another reason to include turmeric in your diet. The other nutritional components found in turmeric (fiber and copper) also have their own unique health benefits, but in all honesty do not significantly help you reach your daily recommended intake (DRI). Because of this, they will not be discussed here. You may want to look into other food sources if you want to reach your DRI of these substances using food. Phytochemicals may sound like a fancy scientific term, but it simply refers to any chemical compounds that are naturally found in plants. While there are several different phytochemicals found in turmeric, the most impressive phytochemical is called curcumin. Curcumin is a carotenoid or naturally occurring pigment that gives turmeric its signature yellow / orange color. Curcumin can be found in other plants such as rose hips (another natural anti-inflammatory) and carrots. Notice that both of these plants have an orange or red coloring to them? This is solely because of the curcumin and other carotenoids. Curcumin has some amazing health benefits. The most well-known benefit of curcumin is its antioxidant capabilities . Without getting too much into the scientific detail of curcumin’s biological activities, curcumin is a scavenger of reactive oxygen species. What does this mean? Simply put, curcumin scavenges and destroys reactive chemicals in the body than can cause (oxidative) harm to cells (DNA to be more specific). Damaged DNA can lead to many unfavorable diseases such as cancer. In addition to the antioxidant properties of curcumin, it is also known for its ability to reduce inflammation. Inflammation is responsible for many diseases such as rheumatoid arthritis, Crohn’s disease, chronic sinusitis, and countless others. .Curcumin has been found to inhibit the activity of compounds in the body (such as COX-2) that cause inflammation. 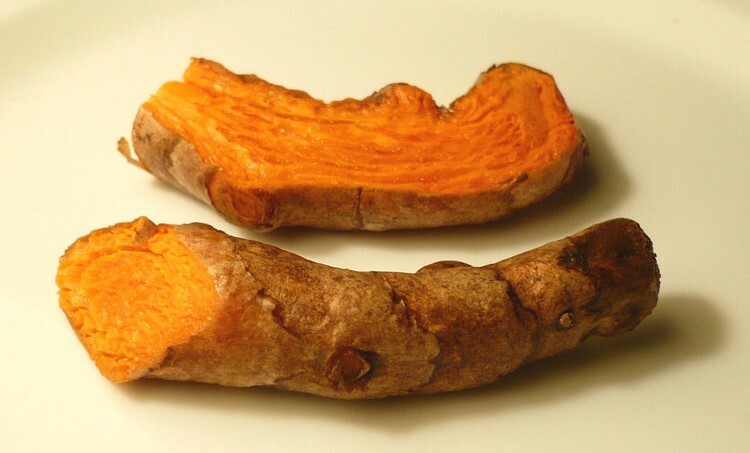 Since the long term us of typical NSAIDs (non-steroidal anti-inflammatory drugs) such as ibuprofen are known to have negative side effects, eating foods with anti-inflammatory properties (such as turmeric) are a safer alternative. Unfortunately, many of the studies that are “about” turmeric are, in reality, specifically studying curcumin. Since the bioavailability (how much your body absorbs) of curcumin is thought to be low, you can also consume black pepper with curcumin or turmeric. This is because black pepper contains a substance called piperine which has been shown to increase the absorption of curcumin by up to 2000% . So if you want to capitalize on the health benefits of turmeric, you may want to consider a turmeric supplement that both contains a considerable amount of curcumin as well as piperine such as this (aff. link). As you can see, turmeric has an impressive nutritional composition. So why not experiment with your cooking and begin to add turmeric to your food whenever you can? While it may not make a noticeable difference in your health right away, it surely will improve your health in the long run.